Elaje is now stocking Skinade, a remarkable drink that nourishes your skin from the inside out. Skinade provides an ultra-convenient and effective addition to your daily skincare regime, with each drink delivering a potent blend of essential micronutrients – the same level 9 tablets would provide – in a single bottle (150ml). With no artificial colouring and naturally flavoured with refreshing peach and mangosteen, Skinade provides hydrolysed marine collagen, omega 3 and 6, MSM, vitamin C, l-lysine and B complex vitamins with only 35 calories. It’s been scientifically formulated with the perfect ratio of liquid to active ingredients providing faster absorption and bio-availability while the key active ingredients work synergistically helping to maintain hydration and efficient skin function. The results speak for themselves, softer, better hydrated skin within six days. Within fourteen days skin looks more radiant, plumper and firmer with a reduction of fine lines and wrinkles. 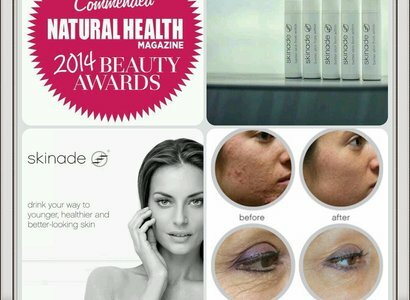 For more information about Skinade, call today and speak to our Beauty Department.